Okay, it happened. 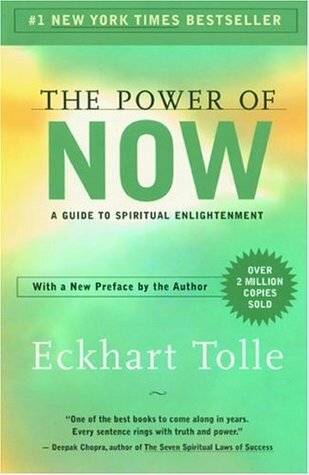 I got into Eckhart Tolle this year. This is a pretty personal post because I’m not sure how else to write it. Previously, I had been approaching spirituality with an interest in Buddhism and this goal to sort of still my mind’s tendency to run off the rails. I would describe myself as a pretty high-strung person. I am a perfectionist in many areas and I worry and beat myself up over what I perceive as my shortcomings. A lot. But something has changed in me over the past few months and a lot of it comes from the work I’ve done with the ideas in this book. And even that doesn’t quite get at it. I say that because it’s not like you read The Power of Now and absorb it or understand it and then move on to the next book. There is a lot of reflection that it inspires and it’s led me to some important realizations about what is important in my life and how a lot of the things that have held me back can simply be let go of, I can just drop them. I am honestly so drawn to this stuff, but it’s almost shameful or embarrassing. How do you get wrapped up in this hippie-dippie self-help spirituality? Well, all I can say is that upon bringing this perspective into my everyday life, a lot of it rings true to my experience. I see the mind now as a tool, and that ability to disidentify from its thoughts and to anchor myself in the present moment is powerful. Time can pull you backwards or forwards and what really is the benefit of that? Of course we can plan and set goals, but that connection with right now, this moment– I find it to be a very compelling way to live and one that has actually improved my life. OK– I will say Tolle says some weird and offensive stuff about gender and sexuality. That I am critical of and I’m still working to figure what exactly it’s all about. Overall, this has been an exciting book for me and one I will come back to. I read this book a couple months back, but I’ve been letting it simmer and slowly collecting my thoughts. I didn’t want to just be done with it– I wanted to grapple with Fromm’s arguments in the context of my everyday experience. His opinions often seem convincing at first glance, but to what extent do they really hold up? His work has it’s faults (like a bunch of weird homophobic statements in this one…), but I’ve been intrigued by Fromm’s social psychology since I first encountered The Sane Society a few years ago. Fromm argues that popular, romantic conceptions of love are often very flawed. He critiques the widespread notion that love is an emotion to be felt or an end state to arrive at. For Fromm, love is a creative capacity. It’s built on choices and actions we perform everyday. It is behavior that is characterized by care, responsibility, respect, and knowledge. We don’t just find “the right person” and magically end up in a state of love– we must learn how to love. Fromm points out the dangers of conceptualizing love as something to “fall” into. It takes away the agency we all have to be loving and obscures what loving behavior is comprised of. It makes love into a thing that one either possesses or lacks, an emotion that must be acquired by way of popularity– by having the right personality, clothes, and lifestyle that is attractive to an equally popular mate. What I like best about this critique is Fromm’s attention to the social context. He was, of course, a sociologist and that background allowed him to pay special attention to the influence of social structure and economic relations in individual psychology. Fromm’s critique of love in Western society shows that our most private emotions and intimate relationships are profoundly shaped by modern consumer society. The larger forces that we tend to think of as structural do in fact shape how we see ourselves, others, and how we go about loving one another in our everyday lives. This is such an important point– one that has been developed further by sociologists like Arlie Russell Hochschild (The Managed Heart: Commercialization of Human Feeling), Miliann Kang (The Managed Hand: Race, Gender, and the Body in Beauty Service Work), and Eva Illouz (Consuming the Romantic Utopia: Love and the Cultural Contradictions of Capitalism), to name a few. Fromm also argues that one must be an independent, whole person in order to love well, to love in a healthy way. In a section on love between parent and child, he slogs through a bunch of Freudian psychology, making some good points and some not so good points. What’s valuable here though is that love can sometimes go awry. Considering the ideal types of motherly and fatherly love for child, we can see how a child often starts off completely connected, undifferentiated from the mother figure. As the child grows, the mother’s unconditional love is contrasted by the father’s conditional love– to receive love from the father, the child must live up to the father’s expectations and wants, they must be good enough. And if they are, only then do they receive father’s love. These motherly and fatherly types of love are limiting when they recur in romantic relationships between adults. To put it simply, we can’t be children if we want to learn the art of loving. Only independent adults can master the skills of care, responsibility, respect, and knowledge that are required. This is important and radical– only through independence can we come into contact with each other and bridge that often painful gap between ourselves and others, addressing that very human longing for connection. Overall, love is a decidedly social phenomenon. It is embedded in the structure of society, in how people are loved as they grow up, and in the options available for fulfilling the need for human connection. This book can be especially valuable today, as we try to navigate through a world where hate seems to be constantly on the rise. Fromm helps us remember that the relationships we tend to see as existing between just two people or within a family are actually part of a much larger social context– this is an important reminder. Otsuka tells the stories of “picture wives,” who traveled from Japan to the United States in the early 1900s to marry and start new lives. High hopes (inflated by future husbands who deceived them about the lives they would lead in America) were quickly dashed by the realities of hard farm labor or domestic servitude. Otsuka’s style, a chorus of voices, is highly effective. At times, she blurs together common experiences, and at others, she presents an endless diversity of hopes and disappointments, joys and suffering. The women in this book are faced with unjust treatment at every turn. They are continually objectified– worked to exhaustion and even death in the fields, coerced into being sexually available to husbands and white men, subject to the indignities of racism and fetishization by white employers. Most endure a hard life of poverty and years of back breaking labor. They work to give their children all they can and are heartbroken when these efforts never seem to be enough to open the doors to mainstream American life. As WWII begins, fear and panic set in. All are constantly on guard, preparing for the inevitable day when husbands will be taken away. They sleep with their clothes and shoes on. They wonder what exactly they did to be seen as traitors. Some of the most poignant moments are those of the last day. As families are evacuated to camps, stores are closed and houses left to be raided, all that they have worked for is simply torn away. This is an important book that makes us look more critically at a cultural obsession with Americanness and the fear of suspicious “outsiders.” It’s a recurring story, sadly, and Otsuka even draws some lines right out of a 2001 Rumsfeld speech. It’s too easy to look away and think some other group’s marginalization doesn’t concern “us.” This book is clearly still relevant, it’s almost a fable, and the saddest part is the way it’s a history that continues to this day. Honestly, I picked up this book for advice on handling those moments of being verbally knocked down and walked over (which seem to be happening all too often in my life recently– thank you, food service work!). The first part of the book is mostly just entertaining– amusing historical examples of people who knew how to sling some nasty comebacks at the drop of a hat. Most interesting to me though is Irvine’s discussion of the social uses of insults, how they establish or reinforce hierarchies, but also help us bond with each other through good-natured teasing. I can’t help but think about this dual nature of insults in relation to microagressions. An insult can be interpreted differently by those involved, and the insulter might think they are doing nothing more than harmless teasing, making a joke that might even draw people together. In this way, the insulter doesn’t have to face the implications of their words and how those words might reinforce systems of oppression. Then, this dynamic makes the person who has been insulted doubt themselves and the validity of their interpretation. Derald Wing Sue talks about the pain of this doubt in Microaggressions in Everyday Life: Race, Gender, and Sexual Orientation (which should be required reading for every human). The psychological and emotional strain of seemingly small, everyday slights can profoundly shape a person’s experience, and ultimately, their life chances. This is also part of the everyday, lived experience that contributes to a sense of double consciousness. Irvine breaks down the many possible responses one can give when insulted, outlining the pros and cons of each approach. Ultimately, he takes cues from the Stoics, who sought a sort of inner equanimity that could not be swayed by insults (or praise). While reading this book, I had a strange sense of coming across this argument before. And yes, as it turns out, I was actually remembering another book by Irvine I had read several years ago, A Guide to the Good Life: The Ancient Art of Stoic Joy. I see so much overlap here with Buddhism. One of the major goals of my own practice is to become mindful of (and able to deal with) the pull of sense perceptions. The mind is like grass blowing in the wind, pulled whatever direction perceptions and emotions take it. If we become solid, like the unmoving log, we are not thrown around so easily and suffering is lessened. The same principle is true of maintaining both inner and outer composure when insulted. The takeaway: when in doubt, just say “Thanks!” and move on with your day. Useful advice indeed.